20. Shellie’s Tour to Ancestral Places. Back home. My tour with Zenon ended much too soon, but we spent 7 more days in Krakow and enjoyed the medieval city and soaked up all the history there. Now I am home with my souviners, photos and memories. I’ve been reviewing my notes and genealogical information that I collected during my tour and I made some exciting discoveries. I realized that one of the birth records that I recorded was actually the wife of my great uncle John Kanty Kadlub. I can’t wait to show it to my cousin in Erie, PA.
Another great find was the marriage record for Vincent Kulawiak and Theckla Rafacz. When I examined this information closely, I realized that Vincent was the brother of my g-g-grandfather Andreas Kulawiak. The family tree of Vincent Kulawiak and Theckla Rafacz, who emigrated to Chicago, was one the first items that I located online when I really got moving on my genealogy last year. But since the tree only moved forward toward his descendants and had no information about Vincent’s ancestors, or the name of his birthplace, I could not establish a link to my family. I am now in the process of contacting the administrator of that family tree to meet my distant cousins. 19. Shellie’s Tour to Ancestral Places. The last day. Our last day in the village. The night before we left, we stopped by Jozef’s bell foundry to say goodbye. He was not home, but his wife Maria promised to give him our best regards and thanks for a wonderful visit. We also stopped by his mother’s house to bid farewell to his parents. Mama Kulawiak said that we would probably never see one another again, but told her I would always remember her in my heart! I really wish I could have gone back far enough in our family tree to find a relationship with her family! Although I looked at Odrowaz on the map before my trip, now that I have seen the land with my own eyes, the map now has more meaning to me. 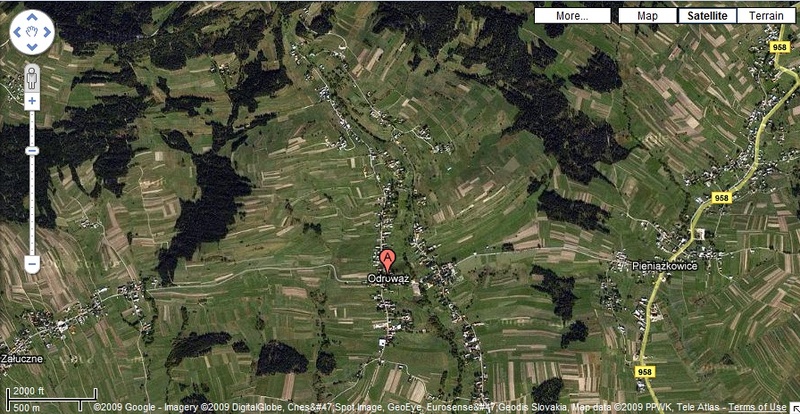 When I look at a satellite image of Odrowaz, I can now see the 7 hills surrounding it. Amost all of the hills have a dark green area where the trees cover the hill top and I can see the farms running along the valleys inside. Odrowąż on google map (click to enlarge). 18. Shellie’s Tour to Ancestral Places. Day 7, part 2. Wow! What a great day! Tonight we went back to see my newly found cousin Vicktor. We made the mistake of going out for dinner before we arrived at his house and couldn’t eat all of the food that he put out for us! As soon as we arrived, he ushered us into his living room and before we knew it, we all had tiny glasses of vodka in our hands and toasted to newly discovered family. Beginning of the second visit. 17. Shellie’s Tour to Ancestral Places. Day 7. Today has been the best day and it’s not even over yet! We traveled to Zakopane this morning to visit the mountains and while we ate breakfast, Zenon reminded me that there was another Kulawiak family that he spoke with before our trip. That family was not related to us, but he called them back to ask if they knew Leopold, the son of Michael, who was the brother of Stanislaw, my g-grandfather (did you follow that?). 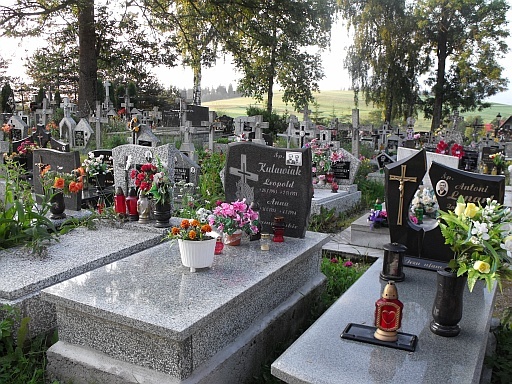 Since Leopold and his wife still had a headstone in the churchyard and someone was placing flowers on the grave, we figured that some relative had to be somewhere nearby. 16. Shellie’s Tour to Ancestral Places. Day 6. 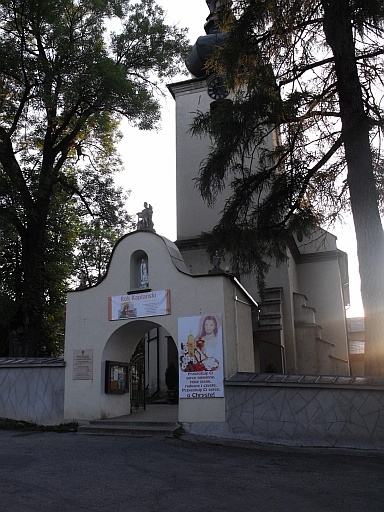 On Wednesday, we traveled to Lusławice, where my grandfather was born! Luslawice is about 30 miles east of Krakow, so we headed north east from our village. I snapped photos all along the way, but we joke that I only photograph trees and cars because when I see something that looks interesting and try to snap a photo with my digital camera, I end up with a car or big tree in the photo because of that frustrating delay so characteristic of digital cameras! We stopped to visit 2 old wooden churches. One was locked, but at the other, the priest gave us a tour! He produced a ring of large ancient looking keys and opened a small door on the south side of the church. When we stepped inside, we were in a tiny room that looked and smelled like a cellar! The priest then unlocked another small door and we stepped into the most amazing church I have ever seen. The wooden interior was even more remarkable than the exterior. The best that I could describe it is that someone built a beautiful church inside a large barn. That is what all the wooden walls reminded me of. It was built in the 1500’s and once had beautiful murals painted on the walls. In the 1970’s, someone painted over the murals with white paint and it was almost impossible to recover these priceless works of art. Still, we could make out many faint images on the walls. Pictures can never catch the true essence of this church, you just have to be there to believe it. 15. Shellie’s Tour to Ancestral Places. Day 5. On day 5 we On our next day, we took a drive west to Zywiec where Żywiec beer is made. There were several ways to get there, so we choose to drive a road that went over the Slovakia border (formerly Czechoslovakia) and then back into Poland. We didn’t know what to expect at the border and had our passports ready but there was no special checkpoint at the border. In fact, we didn’t even realize that we crossed into Slovakia until we were already across the border. Once we were in town, however, we could tell that we were no longer in Poland. Zenon said that all of the signs and the radio were now in Slovakian. I didn’t know enough Polish to notice a difference. The biggest difference that I noticed was the change in architecture from our Polish mountain towns. We saw few of the charming alpine style houses that are so common in Odrowaz and other villages in the Podhale region and more plain concrete structures. Slovakia is part of the European Union and now uses the euro for currency. Zenon explained that people would travel across the border to shop in Slovakia, but now it is reversed. The euro is stronger than the Polish zloty, so now people cross into Poland to shop! By the way, the exchange rate is roughly 3 zloty for each American dollar, so we are finding that prices are quite affordable here – though I have done almost no shopping yet! 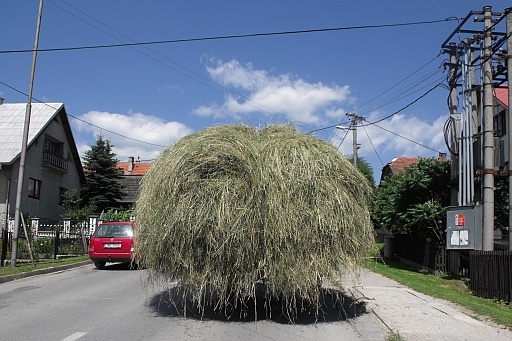 On the outskirts of town we encountered a haywagon; a typical site in the country towns of this area. 14. Shellie’s Tour to Ancestral Places. Day4. The next morning we walked up to the church to watch the funeral procession arrive at the church. When the church bells stopped ringing we entered the church and climbed up an old stone circular staircase to sit in the balcony. I had a wonderful view of the church during this mass attended by so many in the village. Again, the singing was beautiful, but much sadder in tone. Immediately after mass, the procession continued into the churchyard where the coffin was placed over the graveside for the final blessing. 13. Shellie’s Tour to Ancestral Places. Day3. Day 3 was Sunday and we attended mass at the local church, St Mary Magdelene. It was quite a different experience. 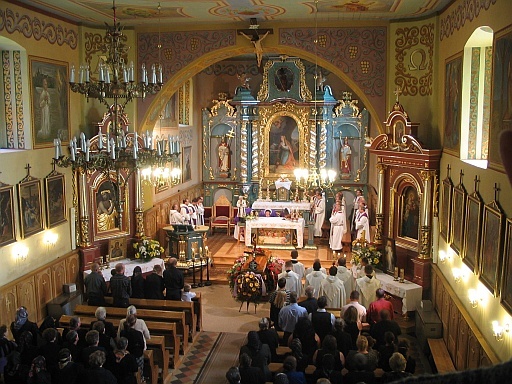 Although the mass was basically the same as in the US, everything, of course, was in Polish. The interior of the church was quite beautiful and ornate, and the beginning of mass began with an alter boy who approached the front of the congregation and began to pull on a rope that passed through a hole in the church ceiling. Suddenly, the church bells began to ring! 12. Shellie’s Tour to Ancestral Places. Day2. Today we went for a drive through neighboring villages of Załuczne, Piekielnik and Jabłonka. Piekelnik nearby Odrowąż. 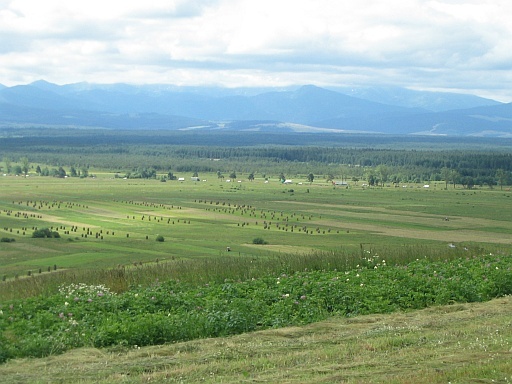 Panoramic view of Tatra Mountains and Shellie in the distance :-). Piekelnik. 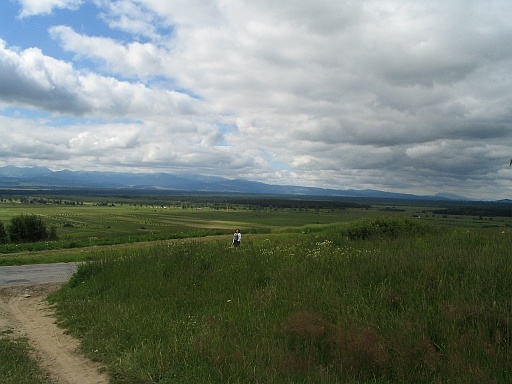 Tatra Mountains in the distance. 11. Shellie’s Tour to Ancestral Places. Day1. After an overnight stay in Brussels, we finally took off for Krakow. 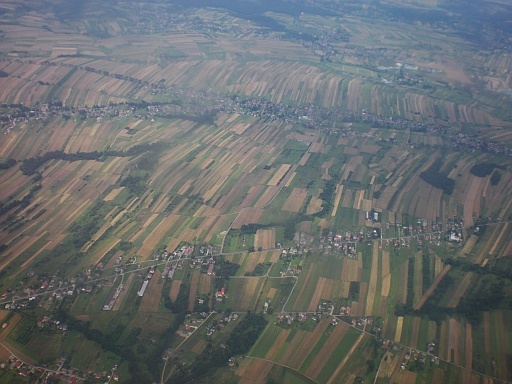 My first glimpse of Poland was from the air and I was surprised to see how the crops were planted. As far as I could see were long strips, making an interesting design of the land. When we arrived at the Krakow airport, Zenon was waiting for us with smiles and quickly whisked us off to Old Town Krakow for a visit to the Ethnographic Museum. 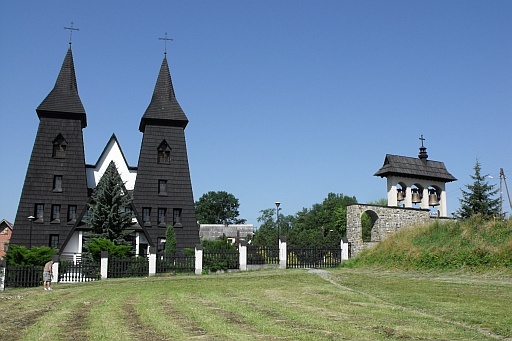 The museum was dedicated to the culture and ways of life in Poland, particularly the Podhale region. Here we saw a reconstruction of an actual home, mill, and school from the region, all from the original materials and items. We also saw many of the beautiful costumes worn in different regions.